Muslim woman or muslimah wear long dress called abaya and large veil. They look so elegant and beautiful appearance. This dresses can be wore in any chance, and always be in flexibility. A veil is an article of clothing, worn almost exclusively by women, that is intended to cover some part of the head or face. As a religious item, it is intended to show honor to an object or space. The abaya is an overgarment worn by some women in parts of the Islamic world. 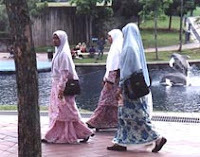 It is the traditional form of hijab, or Islamic dress, for many countries of the Arabian peninsula such as the United Arab Emirates, where it is the national dress. Traditional abayat are black, and may be either a large square of fabric draped from the shoulders or head, or a long caftan. The abaya covers the whole body except the face, feet, and hands. It can be worn with the niqab, a face veil covering all but the eyes. Some women choose to wear long black gloves, so their hands are covered as well. Abayat are known by various names but serve the same purpose, which is to cover up. Contemporary models are usually caftans, cut from light, flowing fabrics like crape, georgette, and chiffon. Styles differ from region to region: some abayat have embroidery on black material while others are brightly coloured and have different forms of artwork across them.